I saw a TV show while I was visiting the kids. (Netflix, natch, they are millenials). Anyway its a good show...Loser (maybe Losers?). They chronicle these great stories of people who never won, but were/are phenomenal anyway. One story was about that woman who has placed high in the Iditarod many times but never won.....Aily Zirkle. She was one of two who were attacked a few years back at night near the finish by a black-out drunk on a snow machine. I'm sure you remember. I think she came in 5th this time. Quite a woman, that one. She gets my respect. Worth watching the show. Ally is a good Sledder and really nice person. Maybe too nice to win it. In any event, she has her work cut out for her with Joar and Peter. Those two guys are going to dominate the race for years is my bet. All they need to do is move the Start Date back a month. Musher Mishi Konno runs along the trail at the start of the Iditarod on March 2, 2019. The Iditarod is at a crossroads. 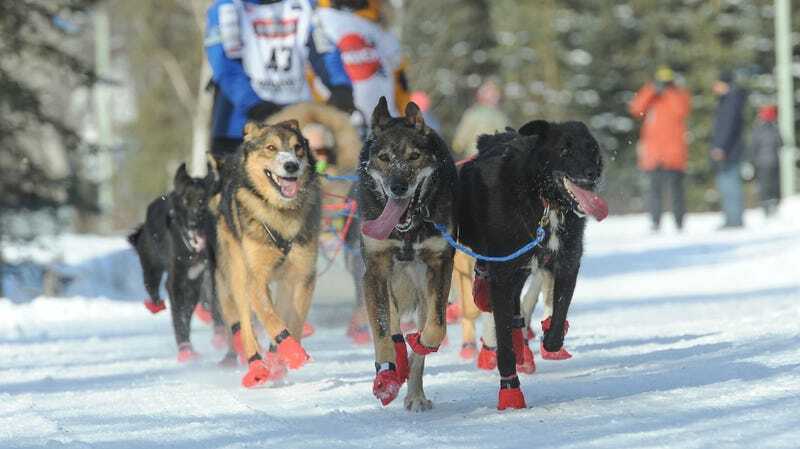 The thousand-mile sled dog race through Alaska is bound as much by tradition as by the rigging between dog-sledders, or mushers, and their dog teams, who must lead each other through some of North America’s wildest land. It’s the sort of tradition one would expect to fade into legend, as new generations melt, alongside the snow, into burgeoning cities, satellite TV, and new, bare ground for lawns. However, a technological revolution has left mushers and their dogs more connected to fans—making the Iditarod more economically tenable, while at the same time opening it up to more criticism from animal rights advocates. Now, America’s wildest sled race is sprinting to integrate new technology, even as climate change threatens its existence. The Iditarod typically has two routes running from Anchorage to Nome, Alaska along the coast of the Bering Sea. (Although since 2003, warming weather and melting snow have increased the use of an alternative trail between Fairbanks and Nome.) Dozens of mushers and their teams of roughly 14 dogs, usually Alaskan and Siberian Huskies, must run the equivalent of a trip from Chicago to Boston, within 8-15 days. Dogs burn through an astonishing 12,000 calories a day on the trail, which can best be described as grueling. It isn’t uncommon for teams to encounter sub-zero temperatures, gale-force winds, and white-out conditions. A grand total of $500,000 is distributed to the top 20 finishers, with the first finisher winning a truck and $50,000. Most of the Iditarod’s 46-year history has been told via HAM radio, faxes, and film. Being a reliable method of communication, even in territories equally reliable in their hostility to any efforts to send signals, Alaska has long had a high population of amateur HAM radio operators. Between official checkpoints like Cripple and Ruby, amateur spotters would relay any information they could glean over HAM headsets. “When I was a kid, if you were on the Iditarod fan list, twice a day, [checkpoint personnel] would fax you a list with all the latest check-ins for each musher,” Mitch Seavey, a member of one of Alaska’s foremost mushing families, recalled in an interview with Earther. Until the mid-2000s, most visual media was recorded in film. Reports and broadcasters hauled only the equipment they could fit on a bush plane. With no options for resupplying, this left media personnel living out of a (heavy) bag, said Zachariah Hughes, a reporter with Alaska Public Media. “Covering the race in those days meant you had to send stories back on the phone or by persuading a pilot, flying a small plane carrying dropped dogs [dogs discontinued from the race] back to caretakers in Anchorage, to take a cassette tape with them and then call the network to tell them when to send someone to the landing strip or airport, often a frozen lake, to pick it up,” Johanna Eurich, a managing editor at KYUK, the public broadcasting station for the Yukon-Kuskokwim Delta, told Earther. Hughes added that when there were landlines available at checkpoints, reporters would sometimes swarm them to play tape-recorded interviews to studio personnel. Aldrich, working with Panasonic, began helping the Iditarod Trail Committee overhaul its technology in 2006. When he started, “[you] wouldn’t even dream of trying to bring out high definition equipment.” But as low-light sensors became more powerful, and the weight of cameras and the GPS outfitted on mushers’ sleds became lighter, around 2010, the Iditarod entered high definition, with a new website. Now, viewers can download an app to track their mushers in real time. Improved compression technology and “cellular bonding”—a technology that essentially stitches together different cell signals (e.g., 3G, 4G, LTE, etc.) to enable people to keep broadcasting amid fluctuating bandwidth—allow media personnel to cover the race live, in steadily more remote areas. For a race that has never had the sponsorship of “extreme” Redbull-sponsorship-type sports, this has breathed new life into the Iditarod. The impact has been greatest on mushers. For one, joked Seavey, the GPS devices many mushers carry—backups to the mandatory trackers issued by the Trail Committee—don’t let them lie to themselves about their progress. Sleds, too, have modernized. They’ve become more durable and their weight has roughly halved in the last few decades as designers turn from traditional woods such as ash, to aluminum and even hockey sticks—a convenient source of carbon composites. This has allowed dogs to run faster, pulling less weight. Yet even alone, with their dogs, in the drifts amid interminable forests of shrouded subarctic pines stretching beneath the aurora, the world web is now a tempting tap away. Using social media has become so tempting, in fact, that in 2016, the Iditarod adopted rules preventing mushers from doing so while racing, ostensibly to improve safety. More eyes on the Iditarod has also opened the sport up to more criticism, however. Animal rights groups like PETA have long criticized the race as inhumane, alleging cases of abuse by kennels competing in the Iditarod. The organization has also called out dog deaths in the Iditarod—around 150 since the race’s start, of the 700-1,000 dogs that compete every year—as well as injuries. In a press release published last week, PETA noted that 235 dogs were pulled from this year’s race, and that one dog died from pneumonia after crossing the finish line. However, some claims PETA has made against musher before have been investigated by Animal Care officer before, and found false. Mushers like Seavey, as well as the Iditarod Trail Committee, say that the dogs, who were bred to run, love racing the trail, and that ignoring that amounts to missing a large part of what makes mushing ethical. The Committee told Earther that the dogs are well cared for, thanks to animal welfare standards and the over 10,000 veterinary examinations conducted on the dogs during the race. And it noted they can be pulled from the race for reasons besides injury and exhaustion, including if an animal grows uncooperative toward its fellow racers. Any of the 235 dogs who were indeed injured this year would have received veterinary care, according to the Committee. Despite this ongoing ethical debate, the newfound attention to the Iditarod on social media seems to have made the sport more tenable as a source of livelihood for mushers. While mushing used to be a seasonal activity—a way to supplement income from a career in fishing, trapping, or oil field work—Seavey says many kennels now offer sledding tours for tourists in the off-season. Mushers, and the Iditarod itself, may need that support if their way of life is to survive. Three times since 2003, the Iditarod route has had to be changed due to lackluster snow cover and higher temperatures causing waterways to remain unfrozen. As the National Oceanic and Atmospheric Administration notes, such conditions can increase the risk of injuries and have forced mushers to drop out of the race before. And these problems will only become more frequent. Alaska is among the fastest-warming places on Earth, with late winter temperatures in the interior and on the west coast running 8 to 9 degrees Fahrenheit warmer than they used to. Last year was, overall, Alaska’s second warmest on record, with temperatures elevated more than 4 degrees Fahrenheit above the long-term average, according to NOAA. The race can find new routes, Seavey said, although they will be found at the expense of tradition. Likewise, some mushing kennels, including Seavey’s own, have had to move chasing the snow. Other Alaskan communities have less insulation from the impacts of climate change. This year, many attending the Iditarod talked about all the blue in the Bering, whose sea ice is in a near-record low territory for the second year in a row. Mushers raced as much to garner attention, clicks, and funding for themselves and the Iditarod before warming erodes their training routes, as they did to win. While they were crossing the finish line in Nome to a familiar celebrations last week, some locals were nursing disappointment over the lack of safe ice to support this year’s Bering Sea Ice Golf Classic tournament. And many of the town’s ice crabbers lamented the open water that’s bleeding them dry. After all, unlike the Iditarod Committee, crabbers can’t change their fishing grounds without moving their homes too. And unlike mushers, social media, lighter equipment, and better cellular bonding broadcasting, can’t ease the blow of being displaced by the rising tides.